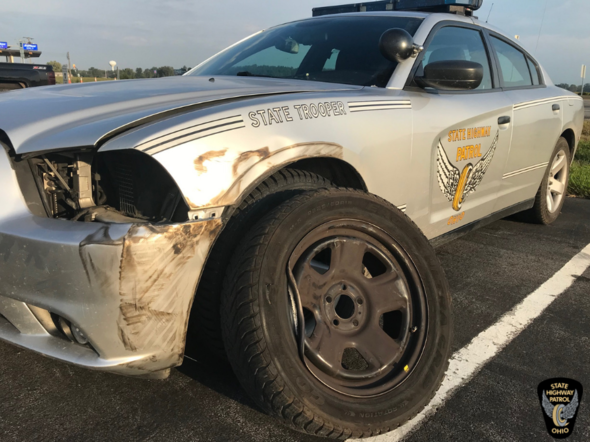 MILAN – The Ohio State Highway Patrol is asking the public for assistance in locating or identifying a commercial vehicle that struck a Patrol cruiser and fled on the Ohio Turnpike early this morning. Troopers are looking for a white Volvo commercial vehicle, hauling a white box trailer. Dash cam video revealed the trailer has a wind faring which spans the entire length of the trailer along with a black placard displayed on the passenger side and rear doors. A trooper from the Milan Post was stopped with activated overhead lights on the side of the road when the cruiser was struck. The trooper had just assisted a motorist with a tire change on the Ohio Turnpike westbound at mile post 122 in Erie County. An unknown white Volvo commercial vehicle drove off the right side of the road, sideswiping the stationary Patrol cruiser at 2:02 a.m. The trooper was inside the Patrol cruiser, wearing a safety belt and was not injured. The cruiser sustained disabling damage to the left front, damaging the wheel and tire. The damage prevented the trooper from pursuing the vehicle. If you have any information locating or identifying the commercial vehicle, please contact the Ohio State Highway Patrol Milan Post at (419) 499-4808 or #677.